A Rich Savory Mushroom Cowgirl Quiche, just what the Dr ordered for your next meal. 2 cups grated Gruyere cheese….just a fancy name for Swiss cheese. 1 pie crust. (Pam’s pie crust). Place the mushrooms on a greased baking tray, pop into a preheated oven and bake at 150 degrees till lightly golden brown, allow to cool. Slice the leeks thinly, and place in ice cold water to soak for 10 minutes, drain and set aside. In a large pan, Heat the margarine. Add the leeks and saute till the leeks are slightly brown, remove and drain on a paper towel. In a bowl, whisk together the eggs and milk till well combined. Whisk in the leeks, mushrooms, grated cheese and add some seasoning. Fold in the prosciutto and mix till everything is well combined. Roll out your pie crust and fold it into your quiche dish. Pour in the filling and cover with foil. Pop into a preheated oven and bake at 180 degrees for 60 minutes. Remove the foil and bake till the top is lightly golden brown. 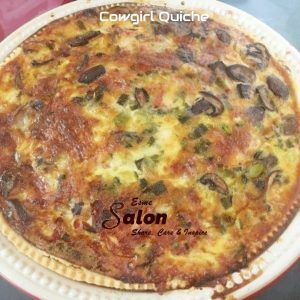 What other types of Quiche do you like? Two cups of good, strong cheese? Sounds good to me. Christmas Eve brunch ….especially as it has prosciutto in it which will please my hubby. Awesome. Let me know what he has to say about it he had it.